“It’s always a highlight of any new development to involve the local community in choosing a name. “It’s great to see once again the positive impact that the building of the new affordable homes in Flintshire is having on the local community. “It was a really good project and we spent a lesson looking at the history of Flint before picking four possible names. 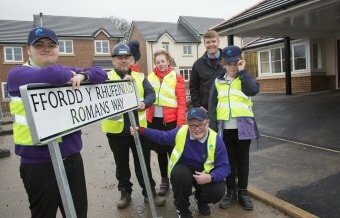 As well as Romans Way the pupils came up with Roderic Street, Raddington Road and Tir Digonedd, which is Welsh for plentiful land. Roderic the Great was King of Wales in 870 and divided his land between his three sons with any dispute to be settled here on the banks of the River Dee while Raddington was the earliest name for Flint and is in William the Conqueror’s Domesday Book.